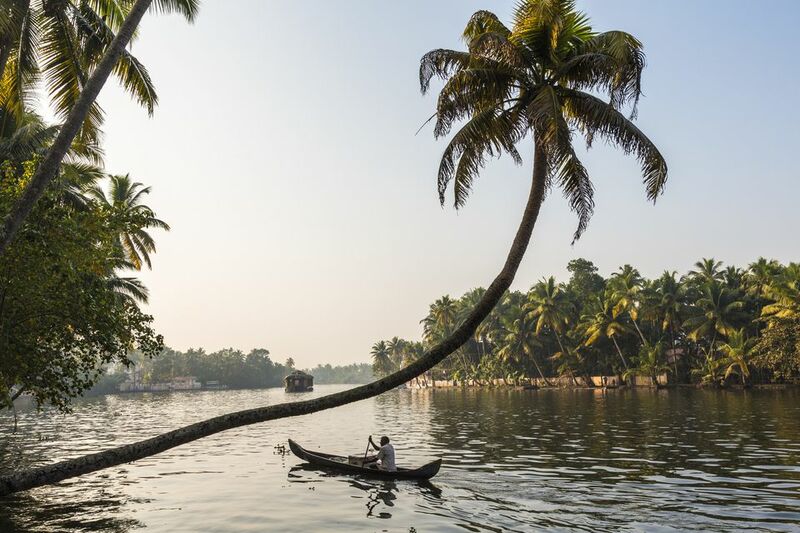 The Kerala backwaters is the rather unappealing name given to the picturesque network of lagoons, lakes, rivers, and canals that run inland from the coast of Kerala, from Cochin to Kollam (Quilon). These photos around the Kerala backwaters show some of the area's attractions, which make the Kerala backwaters one of the top travel destinations in Kerala. 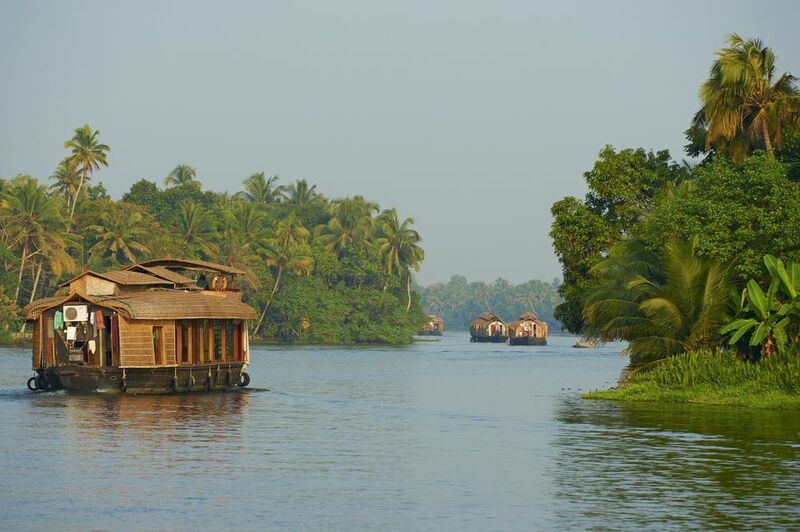 A quintessential experience is a trip along the backwaters in a houseboat. You can hire a houseboat for as little as a few hours or as long as a week! It's up to you. Find out more about houseboats in Kerala and how best to visit the Kerala backwaters. The backwaters are inhabited, and you'll come across many small homes dotting even the narrowest of canals. Some require canoes to move around. In addition to canoes, water taxi is a popular means of transport for the villagers who live along the Kerala backwaters. There are even colorful churches along the Kerala backwaters that village communities attend. Life along the Kerala backwaters is simple and largely self-sufficient. Farming is a major occupation along the Kerala backwaters, and the paddy fields are so lush and peaceful. It's not unusual to come across duck farmers herding huge flocks of ducks along the Kerala backwaters! Fishing in Kerala is still carried out using traditional methods, including nets that are cast by hand. Most fishing is done at night, and is also an activity you can participate in. Even if you don't catch anything, the experience is memorable in itself. The fish is sold fresh at local markets and cooked up in delicious Kerala-style cuisine. Snake boat races are a popular monsoon season activity, held between July and September each year. Many of them take place during the Onam festival. The origin of the races can be traced back more than 400 years, to the kings of Alleppey (Alappuzha) and the surrounding areas. They used to fight with each other in boats along the canals. A few nights spent at a Kerala homestay is the perfect way to really get a feel for life along the Kerala backwaters. Vembanad House is a premium homestay located on the banks of Vembanad Lake, near Alleppey. Bordered by waterfront on three sides, it's a true retreat from the rest of the world, and the perfect place to rejuvenate and enjoy delicious come cooked Kerala cuisine. Take a look at these 9 Top Homestays in Alleppey on the Kerala Backwaters for the best options. If you'd prefer a resort to a homestay, there are some luxurious ones right by the waterfront on Vembanad Lake. Many have wellness spas that offer Ayurvedic treatments. Check out these 10 Relaxing Kumarakom Hotels and Resorts for recommendations.